In response to my last Games I Own blogpost someone asked me when I was going to start blogging about some of the really bad games I own. Well, now I am. I don’t like Doom 3. Or, rather, I don’t like much of Doom 3. The first half an hour or so of the game is pretty good, despite being pretty much a straight rip-off of Half-Life, and there are some bits that really make you jump later on…but the rest of it? Bleh. There’s three main reasons I don’t like Doom 3. The first is that it’s endlessly repetitive – dark hallways go on forever, punctuated only by utterly redundant outside sections and oh, another scared scientist. Worse, it doesn’t even seem like there’s any variation to the game; all I can remember of it is fighting endless bloody imps. The second reason I don’t like it is that the game as a whole is massively contrived and manufactured. 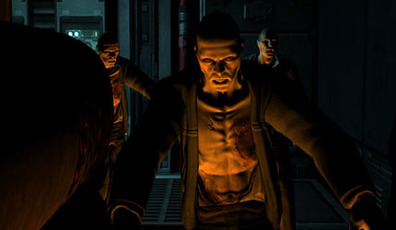 There isn’t a single part of Doom 3 that stands out as being an example of where game design and concept meet; this is a high-tech science base that’s supposed to be utterly self-reliant yet even the well-lit areas are dismal and dim. Everyone moans that there should be duct tape somewhere in the base, but I’m more concerned by the poor lighting conditions even before the demons appear. And a marine should have more important things to do then go fetch eggheads, right? And why doesn’t a single scientist decide to follow the man with a gun, or at least mug him for his weapons? One thing some Doom 3 defenders (or deniers) like to bring up in the face of these claims is that the game was originally very different. The first design for Doom 3 had more survival elements, vehicles and so on…but all this does is lead me onto my third reason for despising Doom 3. That is: it doesn’t appear to really know what it’s supposed to be. The game fluctuates wildly. The perpetually dark corridors, blood smeared walls and suddenly appearing enemies would have you believe it’s a horror game. All well and good, but the endless baddies who exist only to be effortlessly knocked aside with the plentiful weapons and conveniently placed barrels betray the fact that it’s really a corridor FPS. The audio-diaries that hint at secrets, the coded lockers and the levels that let you go back and forth suggest a solid explorative element…but the corridors, lack of rewards and forceful player funnelling say otherwise. This confusion permeates right to the very root of the game. The opening section of the game is very Half-Lifeesque in keeping the POV always within the totally mute character who goes about a simple routine, but the game breaks from this needlessly for many cutscenes that sometimes do nothing but introduce more unimaginative enemies. Doom 3 obviously seems to thinks that just because the previous games had demons in them then it’s obviously part of a horror franchise. It doesn’t understand that it’s actually a pure-bred action romp – or at least not fully enough to embrace that heritage. Instead, it tries to fuse the two and fails horribly because the two can never easily mesh. Horror is formed from moments of intense speed that are contrasted by periods of extreme slowness; the ghost standing still, then quickly pouncing. Action meanwhile is nothing but speed. The blend didn’t work well for F.E.A.R, which had levels which were either scary OR action-orientated, and it doesn’t for Doom 3 either. That’s utterly aside from the fact that none of the original Doom games were really scary to start with – they were about excitement, not panic. The levels were built around the idea of mazes and arenas, not dim, claustrophobic bathrooms. There are things I do like about Doom 3 admittedly, like the Plasma Rifle and the voice acting – but it’s all tiny diamonds buried under a thick layer of cloying, obvious and unimaginative mulch. Times I’ve Completed It: Once – though to be honest I got so tired of it after I got about 3/4s of the way through that I just put God mode on for the remainder. 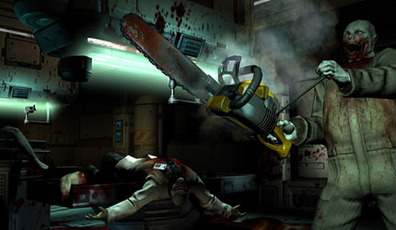 Random Trivia: Not only was Doom 3 a point of contention for id Software staff that lead to at least one person being fired, but it was also prohibitively expensive – an apparent budget of more than $15 million.